Life is as fun as you choose to make it. Having a son-in-law (to be) who is a chef is a beautiful thing! I’ll admit it – cooking has never been my strength. I grew up in a family of movers-and-shakers; we were constantly “going.” We never focused on cooking because that, of course, would involve time for planning, grocery shopping, preparation, cooking, eating and cleaning. Who had time for that? Ha! Not us. Fortunately, Dan, my wonderful son-in-law to be, has taught me that cooking doesn’t have to be time-consuming. It’s really quite simple to throw together fresh, healthy meals. His favorite word is “just.” “You just add a little of this,” or “You just cook it until it’s done,” or “You just add as much of this as you’d like,” he says. For him, it’s all “just” that easy. But, for someone like me whose childhood kitchen never contained fresh herbs, cheese (other than Velveeta), or spices beyond salt and pepper (ok…maybe that’s stretching it…but not much), I have a long road ahead of me to learn to become a decent cook. Happily, I’ve had time in the last year to take on cooking as a new hobby, and I’m actually getting pretty good at it! Dan has inspired me with a few of his “just do this” lessons. With his inspiration, in addition to finding fabulous recipes on my other new hobby, Pinterest, I have to admit I’m kind of having fun preparing fresh, delicious food. Cilantro, basil, REAL cheeses, balsamic vinegar and wine have become staples in my kitchen. It’s a whole new world for a gal who had never tried Chinese, Thai, Japanese or Mexican food until her friends introduced her to it in high school and college. So there you have it. Anyone can learn to cook. It’s really quite simple. You “just” need a little inspiration. Thanks, Dan! 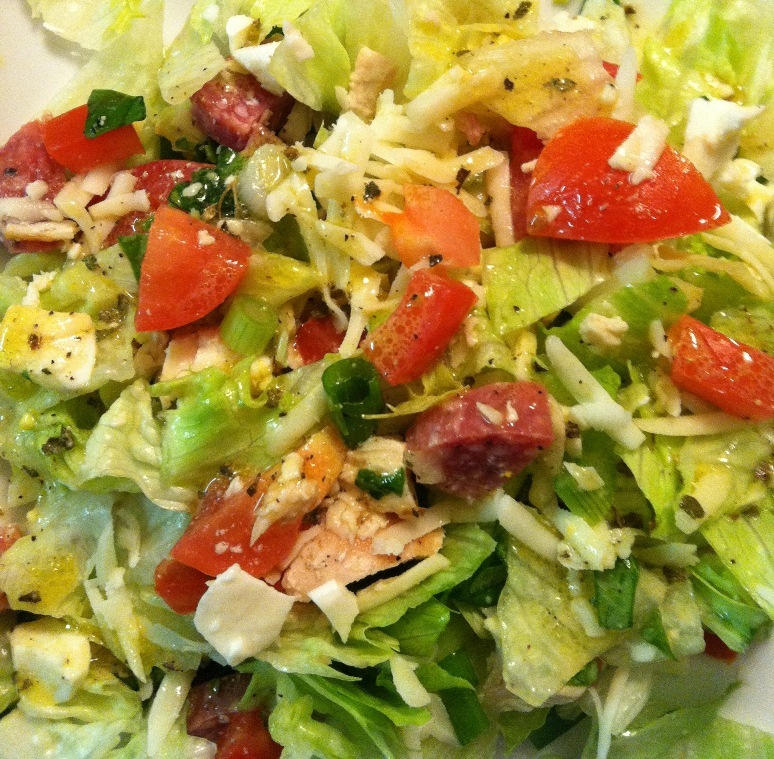 This entry was posted in Cooking and tagged chop chop salad, cooking, food, inspiration thanks by Sheri Leonard. Bookmark the permalink.